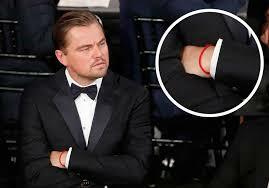 I’m sure you’ve seen the red string bracelets. Madonna wears one. 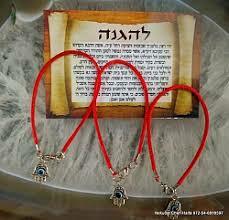 Demi, Gwyneth, Britney… It’s part of Kabbalah, an OLD, OLD branch of Judaic mysticism. It is not mentionied specifically in any part of Jewish history, actually. It is not in the Torah. But it has been around for a long, long time. Without getting into too much dteail, it has something to do with one of the Jewish matriarchs, Rachel. 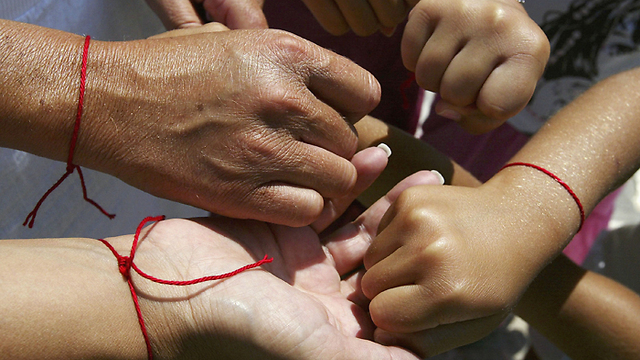 So what is so important about this little red string? 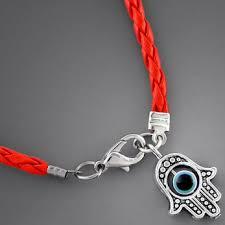 Technically and spiritually, it is supposed to offer protection. 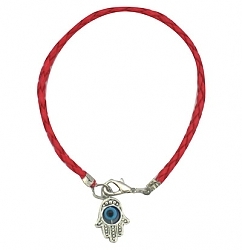 In Hebrew, we say “Ayin Ha’ra,” which means “The Evil Eye.” In Kabbalah, “The Evil Eye” is a very powerful, negative force. It’s all-encompassing. It includes all forms of evil. It refers to the unfriendly stares and unkind glances we sometimes get from people around us. It refers to those negative vibes people give you. According to Kabbalah, when we are vulnerable to such negativity, we are incapable to achiving our full potential. We wear the red string on our left wrist, which is the receiving side of the body (because your heart is on the left). 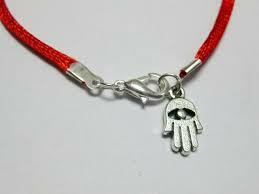 Your red string of protection is a straight shot up your arm to your heart and soul. 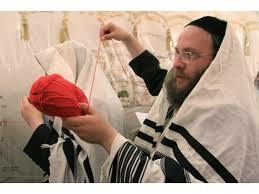 Years ago, my Aunt and I took some classes at The Kabbalah Center. It was magnificent. I drank the kool-aid. I felt very connected to some of my classmates there and some of the staff. I related very much to teachings about positive energy and opening yourself up to goodness, blocking out the bad. But when some of the Center’s rules struck me as a little hypocritical, and there were suddenly always new things to spend money on, I grew increasingly skeptical. I am not accusing them of being a cult or anything, mind you (no, no, let’s save that for the Scientologists), but beside being a cultural center of serenity and kindness, it is definitely a business. I took three classes during my time there. I guess it would equal three semesters. I took a lot of knowledge with me when I left and I would very much like to go back and take more classes some day when I can afford it and feel strong enough to resist the lure of their shiny objects. But I continue to wear my red string. I have been wearing it for about six years. It is habit and it is comfort. You’d be surprised how long one bracelet lasts. It is said that when it absorbs all the negativity it can handle, it falls off naturally. You musn’t rip off the string yourself. In hospitals, they allow you to keep it on for surgery because it is a religious symbol — I took a strange comfort in wearing it through having my gallbladder removed and having my biopsy in 2010. I continue to wear it, I guess, because even though I am not taking classes or reading any of the books these days, and I maintain they should ease up a little on the financial-lust over there, I sort of enjoy what it has come to represent to me. Every now and then, I guess I look down at my red wrist and am reminded I can rise above. It ocassionally reminds me to take a deep breath and avoid negativity. Anyway, a couple weeks ago, someone asked me why I wear it and I gave them a quick, half-hearted answer because I knew they were asking out of judgment (the “you just wear that stupid thing cause Britney does” kind of judgement). And I’ve been meaning to answer the question more thoroughly ever since. When you boil it down to its core, I guess that honestly, I just wear it cause I like the thing.